Pew Research Internet Project completed a study which shows researchers found roughly six out of every 10 American workers prefer e-mail as highly important following by internet to their workflow. 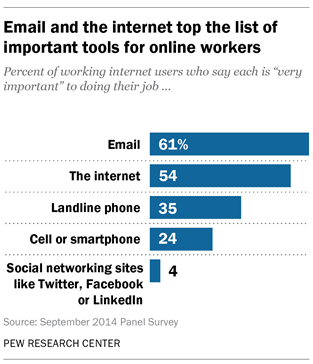 The usual Email communication shows as vital for workers with less preferred landline phones, cellular phones and social networks such as Twitter and Facebook rounding out the list. The statistics are a bit surprising as nowadays we have seen a havoc growth for social media but still Email continued to the best reliable mode of communication in workplace. The study’s statistics can be reviewed to determine the cyber attack against Sony Pictures. That hack job ended up seeing countless pieces of information making its way in to the hands of the public including personal information of celebrities and high-ranking Sony officials. So the percentage shows how an email hack can breach the security of an organization.